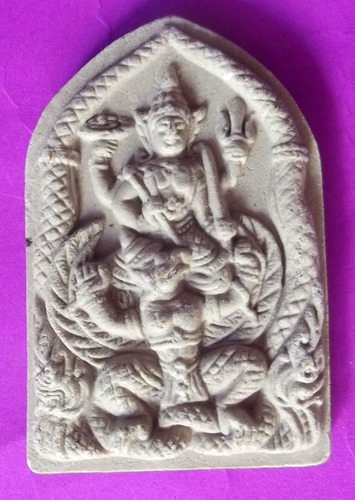 Bucha to Pra Narai Song Krut Sangwan Nak (Vishnu Narayan riding on Garuda Steed with Naga Escorts) is deemed to recieve the Blessings of Succesful Business (Kaa Khaay) and Maha Amnaj (Power) along with Evasion of Obstacles and harmful Accidents (Klaew Klaad). Luang Phu Kam Ban is an aged Master Gaeji Ajarn and Diligent Spiritual Practitioner of the Southern Isan country whose amulets have stood the test of a couple of decades of Bucha, and shown by the satisfaction of his Disciples, that their power is worthy of reverence. 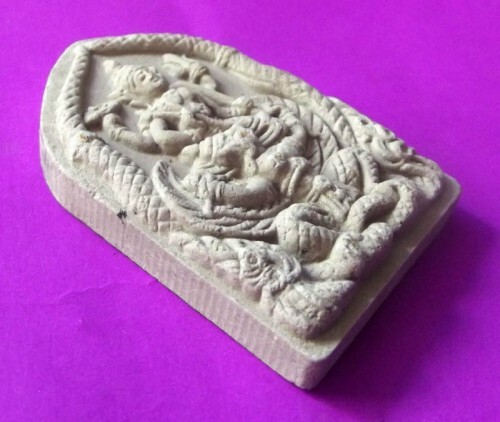 We Highly Recommend this amulet for its great Sacred Power and Beauty, as well as its very affordable price. The Isan is a part of Thailand which spawns a Great Numbaer of Great (but Humble) Master Monks, for its simple Country Lifestyl and easy going Culture is more in tune with feeling the Dhamma, and do not study much intellectual Buddhism, rather get right down to the Nitty Gritty right from the beginning, and work on their own failings, to improve their wisdom, purity and disentanglement in Samsara. 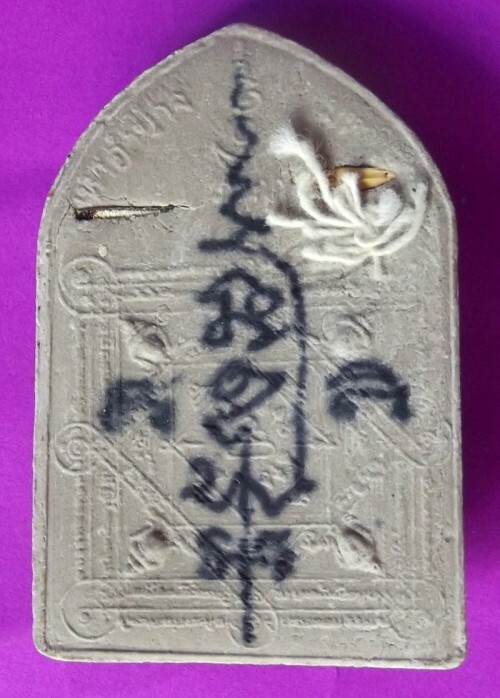 The rear face has two different Spells or Blessings added by insertion, which differ as Luang Phu made blessings on the rear face of each amulet, inserting relics, takrut, or other sacred items such as Khaw Sek (enchanted rice grain), Sincana cords or a range of other items. Each amulet can this differ slightly in the type of Sacred Objects inserted in the rear face. Please take this into Consideration. 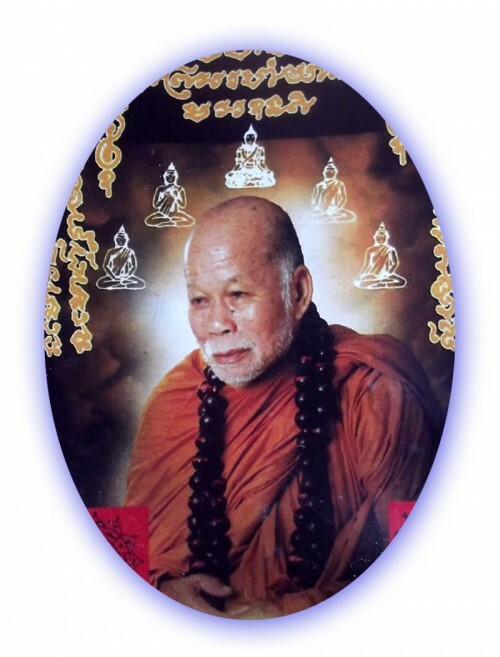 Luang Phu Kam Ban is typically representative of such a Monk who comes from a Generation of Practitioners of Great Attainments. 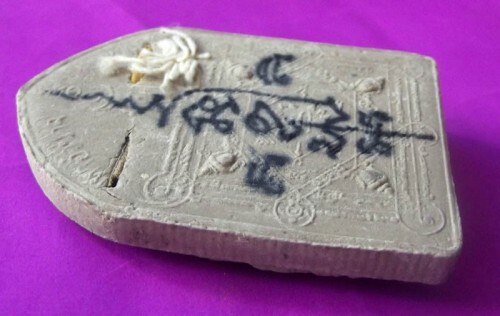 Made from Nuea Pong Toop (Sacred Incense Powders and Ashes taken from Sacred Shrines), the amulet has received hand inscription of Sacred yantra Spell and Blessings from Luang Phu Kam Ban on each amulet, written in Ancient Khom Agkhara (Ancient Khmer/Thai Magical Script).